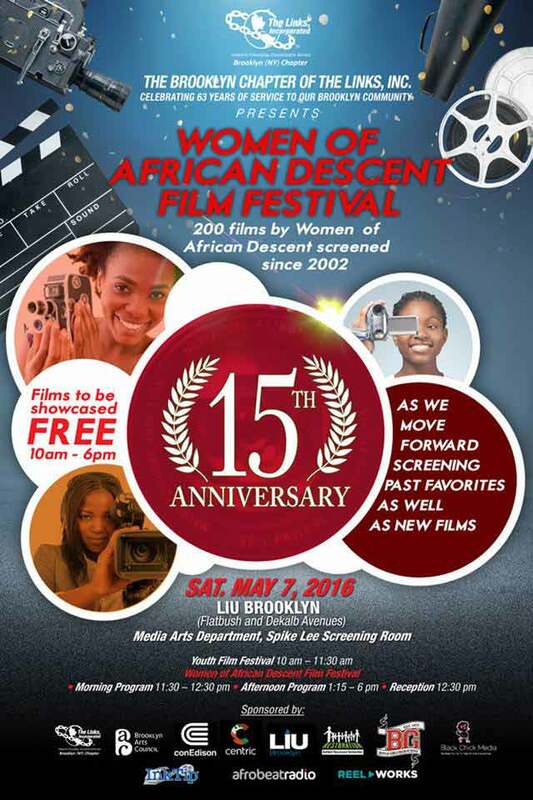 The Brooklyn Chapter of The Links announces the 15th Annual Women of African Descent Film Festival (WADFF). WADFF will showcase films focused on Women, their families, neighborhoods, and the global community. Featuring an international roster of films, the Festival will take place on Saturday, 7 May 2016 at LIU Brooklyn, Media Arts Department, Spike Lee Screening Room, 10 am – 6 pm. Films are produced, written, or directed by a female filmmaker of African descent and have been completed on or after June 1, 2010. Jurors Choice Awards and stipends will be presented to participating filmmakers. 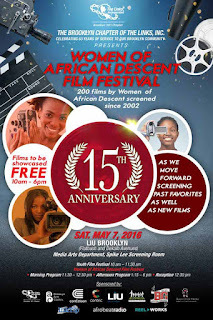 Continuing its legacy of showcasing the talent and accomplishments of artists of African descent, The Women of African Descent Film Festival is celebrating its 15th Anniversary in 2016. Formed in 1952, The Brooklyn Chapter of The Links is dedicated to the support of educational, civic and cultural activities in Brooklyn. It is a chapter of The Links, Inc. an international, not-for-profit corporation, whose membership consists of 14,000 professional women of color in 282 chapters located in 41 states, the District of Columbia, and the Commonwealth of the Bahamas. The Brooklyn Chapter works under the guidelines of its national organization in providing services to its Brooklyn Community in five mission areas: The Arts, Services to Youth, National Trends and Services, International Trends, and Health and Wellness. A focus of the Chapter’s arts programming is to empower women and youth by lending support and encouragement to emerging artists – with a particular focus on filmmakers for the past 15 years. The foundation for all of the chapter’s programs and services is rooted in the African American tradition of giving and volunteerism. Members share a deep sense of communal responsibility, and for the past 63 years, have been committed to actively initiating and supporting educational, cultural, and civic programs that positively impact the lives of people of African descent residing in Brooklyn.